Fox Commercial Spray & Sign Ltd. are proven masters in the fine art of applying stunning, head-turning paint and graphics onto commercial vehicles. We dropped into their state-of-the-art facility in Oranmore, County Galway to find out more about this exceptional, trailblazing family operation from founder / proprietor Sean Fox. Boasting more than 20 years’experience, Fox Commercial Spray & Sign Ltd. specialises in spray painting and sign writing on cars, vans, trucks, coaches and track vehicles. The vast range of services provided includes spray painting, full re-sprays, panel beating, crash repairs, re-finishing, vehicle graphics, car / van branding and graphics for commercial machinery and rally cars. 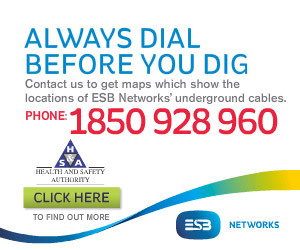 Based in Oranmore, County Galway, they also provide a digital printing service, incorporating the printing of labels, corriboard signs, stickers and product labels, etc. They also sell a range of Health & Safety signs that can be customised to specific requirements. Providing graphics design and application services under one roof and operating one of the most modern digital printers on the market, Fox Commercial Spray & Sign have forged an unrivalled reputation for excellence in applying company colours / logos / livery and fleet changes on artic and rigid units, light commercial vehicles, farm and plant machinery, etc. They’re also authorised by the National Transport Authority to supply taxi door signage and to carry out warranty work for main dealers. Servicing a wide and varied customer base including hauliers, main dealers, oil companies, private individuals, taxi drivers, rally drivers, schools, shops, farmers, local business people, hurling clubs, etc. Fox Commercial Spray & Sign provide complete customer satisfaction at all times and this has resulted in a large volume of repeat business from their loyal customer base as well as a steady flow of new jobs resulting from positive word of mouth and referrals. Vehicle refinishing at Fox Commercial Spray & Sign has been transformed by the installation of a state-of-the-art, digitally-controlled, low-bake Blowtherm commercial spray booth complemented by the use of environmentally-friendly, high solid compliant paint products to professionally and efficiently bring a vehicle from bare metal to an optimum durable quality paint finish. Meanwhile, the creative graphics team at Fox Commercial Spray & Sign can produce top quality signs, displays, vehicle painting, printing and graphics, taking great pride in delivering the quality needed to achieve maximum visual impact. The complete service is offered in-house from initial consultation to working with clients to design logos and colour schemes through to application. Vehicle graphics solutions –a cost-effective ways of advertising businesses –can be tailored in accordance with the individual client’s needs and budget. Fox Commercial Spray & Sign also supply a large range of labels and signs including Mandatory Safety signs, Hazard Safety, Traffic Warning, General Safety, Prohibition Safety, Emergency Escape and First Aid signs as well as digital and sign vinyl, fluorescent reflectives, printable magnetic signs, digitally-printed posters, window film, corriboard signs in any size or colour and composite aluminium signs, Health & Safety signage, shopfront signage –all of which can be provided in any shape, size or colour with company logos included if desired. Reflecting on the genesis of the business, which he runs alongside his wife, Julie, founder Sean Fox –who is a fully-qualified, vastly-experienced spray painting technician - notes: “We’ve been trading as Fox Commercial Spray & Sign Ltd. for 14 years. My initial trade was spray painting computers prior to that, so I’ve always been involved in the spray painting industry. The high-spec, state-of-the-art low-bake booth was purchased and, as demand grew, Sean then decided that instead of purchasing graphics and decals, he should do his own graphics in-house. All the necessary equipment and software was acquired and Julie secured her qualifications in desktop publishing and design and took over the running of the graphics side of the business. “We were now offering design and vehicle graphics services as well as the painting, so customers could deal with one point of contact and we could cater for all their needs. Although they still work on plant machinery, around 80% of the work is now carried out on commercial vehicles. Fox Commercial Spray & Sign Ltd. is renowned as the first port of call for high-quality, professional vehicle design, graphics, painting and finishing and some of the recent jobs completed on behalf of clients like Hastings Transport, McGrath Concrete, Walsh Waste, Value Tech and Roadstone is nothing short of a visual treat. 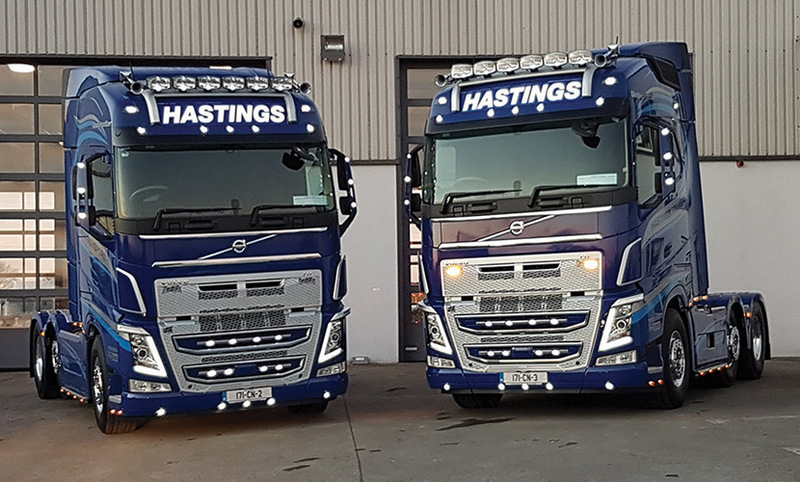 Regular work is also undertaken on behalf of a host of main dealers including Irish Commercials, Harris, Shaw Commercials and Galway Truck Centre. “We meet our customers and see what their needs are and design something that’s going to meet those requirements. When doing refinishes, a lot of the trucks are taken back to bare metal before you apply any graphics, so it’s a painstaking and meticulous procedure. Everything is done in-house by highly-skilled personnel, most of whom are here for twelve years or more. “In order to get a customer to earn your trust, the quality has to be there and the price has to be affordable. It’s hard work and you have to be fully committed to achieving a quality finish. You need to be creative and have the ability to get inside their heads and see exactly what they are looking for. “Preparation is key to any finish and that’s a vital part of our service. It could take the best part of 80 hours from start to finish to completely strip down a tractor unit and on top of that it could take 10-15 hours just to sign off on the graphics and up to five hours to apply them, so it’s certainly time-consuming. Attention to detail and customer care are paramount and that’s how you keep them coming back. Sean has invested in top-of-the-range equipment since the beginning and it’s all still as good as it was the day he bought it. He’s recently purchased a new Mimaki CJV 150-130 integrated printer cutter, which represents another major asset to the business.